A recent decision of the Ontario Superior Court of Justice, VPM Marketing v Jenne, 2018 ONSC 4627 (“Jenne”), sheds light on the risks of “informal” employment relationships where this no written employment contract. The plaintiff, VPM, is a small marketing firm founded by David Mitchell. In 1992, VPM partnered with another marketing firm, BAMS Marketing. No contract was ever signed. Both firms were very small, and the partnership was effectively a partnership between two people: David Mitchell of VPM and Stephen Jenne of BAMS. The firms came to operate as a single business, although VPM was the more established of the two. In practice, Stephen Jenne and his wife, Barbara, received all of their income from VPM. David Mitchell died unexpectedly in 2010. David’s widow, Patricia, became VPM’s sole shareholder, director, and officer. Shortly after David’s death, Stephen Jenne met with Patricia and agreed to continue the partnership between VPM and BAMS, although Stephen would take over much of David’s work. Again, no contract was signed. Over the course of the next year, the Jennes unilaterally ended the division of labour between VPM and BAMS. The Jennes started providing the services that had once been provided by David Mitchell, and the clients that the two firms had shared became clients of BAMS alone. The Jennes offered to pay Patricia $48,000 in exchange for her retirement. Patricia rejected the offer and brought a claim against the Jennes. In effect, Patricia alleged that Stephen Jenne had been an employee or, alternatively, a dependent contractor of VPM from 1992 until David’s death in 2010. As an employee or a dependent contractor, Stephen had a fiduciary duty to VPM, and so was not free to redirect VPM’s business to his own firm. The Jennes argued that the relationship between Stephen and David had been a business partnership, not an employment relationship. Moreover, there had never been a contract of any kind. The Court held that Stephen had been a dependent contractor of VPM. The leading case on dependent contractor status is McKee v Reid’s Heritage Holmes Ltd, 2009 ONCA 916. In that case, the Ontario Court of Appeal held that a dependent contractor is a contractor who works almost exclusively for a single client for a long period of time. The Court accepted that Stephen had worked exclusively “for” VPM from 1992 to 2010. Additionally, all of his income had come from VPM. The Court ordered the Jennes to pay Patricia $614,624 in compensatory damages. The amount was based on a calculation of how much income the Jennes had cost Patricia over a period of four years. The Court also awarded Patricia $30,000 in punitive damages, which are only awarded when the defendant’s conduct is so outrageous as to warrant punishment beyond what is required to compensate the plaintiff. In Jenne, the Court found that Stephen had betrayed Patricia’s trust, which was sufficient to justify punitive damages. There are few, if any, benefits of an “informal” employment or contractor relationship. In Jenne, the parties disagreed not only on the terms of the relationship, but on the nature of the relationship. Patricia saw Stephen as an employee of her late husband, but Stephen saw himself as David’s business partner. These ambiguities could have been avoided if there had been a proper contract between the parties. 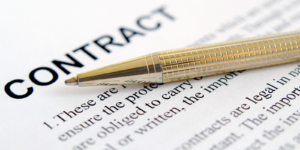 Employment relationships, even non-traditional ones, should be governed by a written contract whenever possible. If you are a company looking to have contracts drafted, or are an employee looking to have a contract reviewed, contact Monkhouse Law.